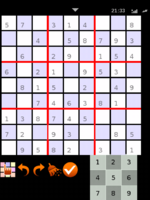 Sudoku is a UI application and it plays like normal sudoku puzzle games. 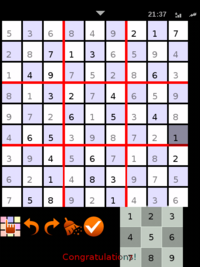 It is a logic-based number-placement puzzle. The objective is to fill a 9×9 grid so that each column, each row, and each of the nine 3×3 boxes (also called blocks or regions) contains the digits from 1 to 9 only one time each. The puzzle setter provides a partially completed grid. 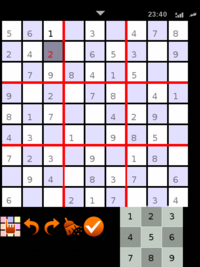 For more information, refer to the Sudoku rules. There are 5 icons and a number keyboard at the bottom. Choose one empty grid and pick up one suitable number to fill in! If the number is wrong/illegal, that number shows up in red. This UI application is written by python. Download the source code, it comes with a generator and solver. You can generate different level of puzzles. Code is from here. Check the README document! This page was last modified on 6 December 2009, at 22:19.